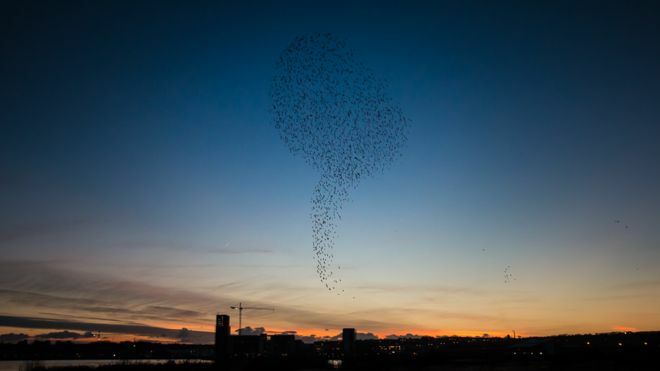 Rowan Dent writes for us about autumn migrations and the birds in Cardiff. Autumn in Cardiff sees the city filled with birds returning from a feast of butterflies and berries in northern Europe and Asia. Like me, they are strangers to the city but seem to know where to make their home. Come winter, even the centre of Cardiff becomes host to little pockets of wildlife. Pied wagtails roost in the clogged gutters and chrome-plated arms of Cardiff city centre’s newest buildings on the Hayes. Dark-eyed Canada geese can be found in Roath Lake. Take a stroll through the red-gold trees of Bute Park to Blackweir and you might be lucky enough to spot a few lusty sea salmon leaping upstream as starlings create magic eye patterns with their sculptural murmurations. If you venture a little further afield the rewards can be surprising. At Lavernock Point 8km south of Cardiff, you can spot rare migratory birds like fieldfares and redwings across the Bristol Channel (not far from where the Welsh government is threatening to dump 300,000 tonnes of radioactive mud dredged from Hinkley Point). Curlews, redshanks, dunlins and oystercatchers feed on Newport Wetlands, using their elegant pointy beaks to sift through the mud for worms and grubs. I’ve never heard them but twitchers claim that at Cosmeston Lakes just outside Penarth you can hear the eerie booming of bitterns at dusk. This extraordinary hejira is an ancient phenomenon. 3,000 years ago, Homer and Aristotle noted that birds fly across the seas every winter and the ancient world was filled with fanciful ideas about where they went. Aristotle and his students believed that swallows hibernated, for example. Or that the birds that arrived for the winter were the very same birds they had seen all summer long, just wearing a muted winter wardrobe. The magnificently entitled 1703 pamphlet “An Essay toward the Probable Solution of this Question: Whence come the Stork and the Turtledove, the Crane, and the Swallow, when they Know and Observe the Appointed Time of their Coming” claimed that when birds disappeared in autumn, they went very far away. About 384,400 km away in fact. To the moon. Since then, ornithologists have used tracking devices to uncover the web-like paths of migration across the world. Navigating by the stars, magnetic fields and polarized light patterns invisible to humans, migratory birds follow a complex internal map which enables them to cross oceans and continents without getting lost. When the time comes to migrate, many birds enter a stage of hyperphagia, where hormones compel them to store extra fat to use as energy while travelling. Some bird species double their body weight in the weeks leading up to migration. Even caged migratory birds will start to anxiously look in the direction of their eventual destination. It might be the lengthening of days or the cooling air, but somehow they know it’s time to leave. There’s even a word for this in German: Zugunruhe, literally ‘journey disquiet’. And as they take to the skies, flocks create elaborate strategies to protect each other from predation and exhaustion, keeping the youngest birds safe in the middle as the older ones take turns at the front where the going is toughest. Curiously, migratory birds actually have smaller brains than resident species, proving once and for all that bigger isn’t always better. As well as using magnetic fields and natural landmarks, they can even smell when its time to land. Migratory birds know no borders. Home is where there is food, space, sanctuary. As I settle into my new nest in a city which is both foreign and familiar to me, I am comforted by the chatter of our northern visitors. It seems to me like a glorious gift – even as the days grow dark and bitter cold our skies and seas are filled with fireworks of feathers and song. Rowan Dent is a freelance copywriter and poet who likes pigs, Oxford commas, and origin myths. She lives in Canton with her partner and a garden of baby vegetables.